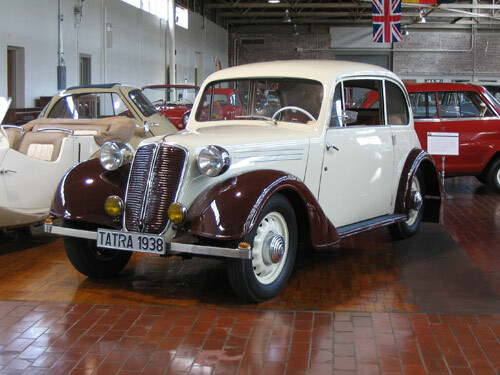 In 1931, Tatra introduced the T-57 model, with air-cooled, 4 cylinder, overhead valve engines placed in the front. 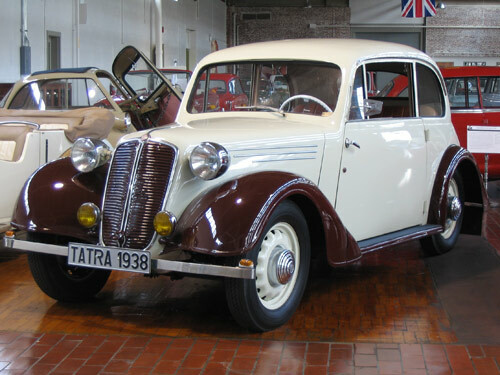 The T-57 was one of Tatra’s most popular models and remained in production until after World War II. The example shown here is a T-57b. It was produced in various body styles. The T-57 was nicknamed “Hadimrška” which means “swift little lizard.” The T-57 was produced concurrently with the T-97 and T-87 to the right of this vehicle. While the T-87 with its v-8 engine and streamlined body was Tatra’s premier offering, the T-57 was a more economical car for the masses. It lacked the top speed and braking performance (because the brakes are mechanical) of the streamlined T-87 model. Consequently, the T-57 was produced in large volume–26,540 models.